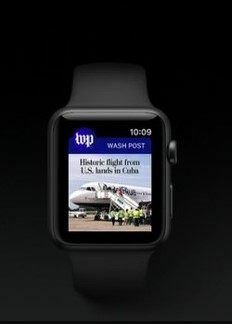 Apple Watch is a great tool. It helps users stay organized and be productive. Using the Calendar app, you can view on Apple Watch upcoming events for the day, by day or as a straightforward list. When you locate the event you are interested in, tap it to display the event. Raise you wrist and display the watch face. If the watch face includes a Calendar complication, you can tap the Calendar complication to go straight from the watch face to the Calendar app. Tap Calendar to open the Calendar app showing the screen you used last (for example Today). Turn the Digital Crown clockwise. Further details for the event will appear (for example, the repeat schedule for a repeating event). Tap Today, and the Today screen will appear again. Turn the Digital Crown clockwise, and later events appear. Force-touch the screen to display the Options screen. Tap Day, and the events will appear in Day view, showing a timeline on the right side of the screen. Force-touch the screen and the Options screen will open. Tap List, and the events will appear in List view. To scroll down or up the list, turn the Digital Crown. Tap the button in the upper-left corner of the screen, and the month will appear. You can tap another day to display it. In fact, Apple Watch displays the same calendars as the Calendar app on iPhone. Thus to specify the calendars you want to see, press Home on iPhone. Next, tap the buttons to place a check mark on each calendar you want to display. You can tap Show All Calendars or Hide All Calendars at the top of the screen to toggle all check marks On or Off. When you finish choosing calendars, tap Done. Calendar as an App is more than simply a schedule or a planner. Alongside with the intuitive interface it should feature integration with other day-planning apps, social networks, contacts, etc. Such an integration is a must-have for modern applications, as well as wearables support. In other words, the modern Calendar is closer to a digital assistant than to the calendars of the days past. Surprisingly, the stock Calendar App coming in a bundle with watchOS is not too good. The top place is taken by the third-party app Fantastical 2 from Flexibits. Please, note separate purchases for the iPhone and iPad! Fantastical features in-app integration with Google or iCloud calendars, thus collecting also Eventbrite and Facebook alerts and notifications. The main screen displays a full or partial calendar month on the top and a chronological list of appointments below. Rather than a choose-your-own-account method, Fantastical offers an integration with the Calendar, displaying only the accounts checked in Settings. As for the screens, there are three views to choose from: DayTicker, displaying only days that have events, a full dot-style monthly calendar, and a week view with an hourly overview of your upcoming schedule. The last view is the only one to display free time gaps on the calendar, because Fantastical is an event-oriented app. It shows only to-do lists and upcoming events. Fantastical features support for Split View and Slide Over and Apple Watch Reminders. The natural language engine will parse an incoherent string of words in a sensible up-coming event. Sunrise App from Microsoft is a runner up. It’s a free calendar app, integrated with social networks and productivity apps. Unfortunately, the project is shut down August 31, 2016, but the support is prolonged. No updates will come, but the app is still reliable and working. It features a great cross-platform integration, GitHub, TripIt, Asana, Evernote, Trello, Google Tasks, Songkick, Wunderlist, Twitter, Facebook, LinkedIn and Foursquare included. Sunrise needs Facebook, iCloud or Google calendar account to piggyback it. The monthly view is displayed in the top half of the screen, while the checklist is displayed in the bottom half. With the day of the month highlighted, a user can see the to-do list or the events list. True to its title, Sunrise don’t miss weather conditions and displays those in the line with the events. Events can be geo-tagged, provided a user has granted an access to his or her location. The app can differentiate the events, either they’re reminders, or to-do things or tasks. Moleskine Timepage from the long-known manufacturer of leather-bound day planners ($4.99) is the carbon copy of this same book both in functionality and interface. The notes are contained within a single infinitely scrollable page. To see the events or tasks planned for the date, a user has to tap it to expand. The expanded screen displays the notes, the weather forecast, the events planned, as well as locations and related contacts. As a planner Moleskine Timepage can’t stand empty dates. Those ones display various historical info relating to this specific date in the past. The app allows to set reminders to go off at a certain time. 24me Smart Personal Assistant is another free calendar/planner app that allows to gather all events, notes and links in one screen. It connects to social networks, service providers, financial institutions and other parts of daily life, brings up maps and locations, set alerts and reminders. What’s more, the app allows to make notes in speech, using the microphone or the web camera. The navigation between screens – Calendar, Tasks, Notifications, More – is performed by the Top Bar. Dates bar reveals the dates organized by months. All-Day displays a list of events and tasks without a specific time during the day. Time grid displays a list of events and tasks with specific time during the day. Task View lists all the tasks under 4 groups based on their scheduled time. Tasks can be ranged by priority, labeled or get some notes to describe them better. More button on the Top Bar reveals My Links. It links social networks, financials accounts, service providers, TaskRabbit (in the US only) and local apps such as Calendar, Contacts and Reminders to 24me. Settings is also accessible by tapping on the More button on the Top Bar, providing an array of options to choose from, including logging out of 24me, and turning off the welcome animation. Notification center displays reminders, along with tasks that are shared with the user from other people and meeting invitations. Trade in your old Apple Watch for top cash : We at iGotOffer buy your old consumer electronics for the highest price online, Apple Watches included. Sell your old Apple Watch now and save money for a new device. Video uploaded on April 8, 2015.